This is a quick overview of the process for making 9 hole buttons from scratch. What's a 9-hole button? It's a button with extra holes that lets you sew them on with letters, numbers, symbols or simple designs. I've only monogrammed my cuffs, but scoochmaroo took them to an entirely other levels with her amazing custom shirt. These are the same size as regular shirt buttons and were inspired by this post on Craft:blog and these much larger buttons from ABC Buttons. In brief the steps are: 1) Make an original by lathing some jeweler's wax to shape. 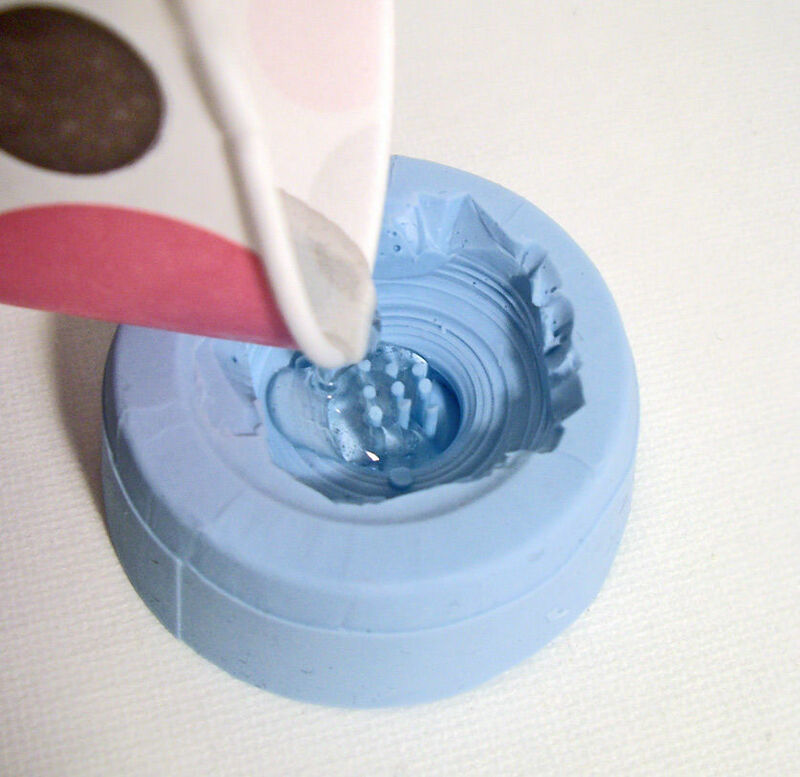 2) Drill the grid of holes (using the technique from this Instructable). 3) Make a silicone mold of the original. 4) Make a cast of the button in polyurethane resin. 5) trim and sand the back of the button smooth. 6) repeat steps 4 & 5 a bunch of times. 7) sew. There are a few more words on the process on my blog if you're so inclined. Why couldn't you just drill more holes into an existing button? 1) What fun would that be? 2) There's no room. You can drill a new hole in the middle no problem (See my diagram) but the edge holes have to be at least 1mm in diameter since they need to be big enough to fit a needle and thread. However every single shirt button in my house has less than 1mm spacing between the button holes. You might be able to get away with it on a large coat button, but then you can already buy those. Very pleasing. You also answered a question that I had about casting resin - I have been wondering how to get smooth backs on some game pieces I am thinking about. Sanding may be the only answer. Thanks. Any time you cast there's going to be some manual cleanup. The trick is figuring out where to put the sprue so that it's easy to clean up and won't be noticeable. Making a two part mold would reduce the amount of cleanup but it adds a lot of complexity to the project. If your shape will let you do a single sided mold (not very much overhang) then this is the way to go.